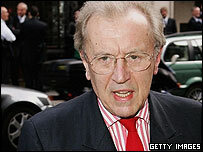 Veteran UK broadcaster Sir David Frost is to join Arabic-language TV station al-Jazeera, the network has confirmed. Sir David is to appear on al-Jazeera International, the pan-Arab news network's new English-language channel, due to be launched next spring. The Qatar-based channel said Sir David, who broadcast his final Breakfast with Frost programme for the BBC in May, would be among the "key on-air talent". Sir David was quoted as saying he felt "excitement" about his new role. 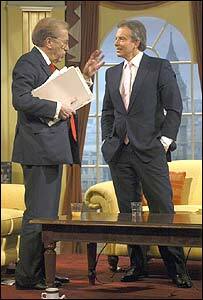 "Most of the television I have done over the years has been aimed at British and American audiences," he said. "This time, while our target is still Britain and America, the excitement is that it is also the six billion other inhabitants of the globe." Sir David notched up 500 editions of Breakfast with Frost before bowing out. An al-Jazeera statement called Sir David "the only person to have interviewed the last seven presidents of the United States and the last six prime ministers of the United Kingdom". It said: "(He) has joined the line-up of key on-air talent at the new 24-hour English language news and current affairs channel." Sir David first came to prominence on television in the early 1960s, when he presented the satirical BBC show That Was the Week that Was. He presented a series of news and current affairs programmes in the UK and America. Frost's interviews with Richard Nixon after Watergate were revealing, much acclaimed and achieved the largest audience for a news interview in history. He worked for ITV breakfast station TV-am in the 1980s before rejoining the BBC in 1992. Last month al-Jazeera launched a children's channel as part of its expansion plans. It also has a sports channel and one dedicated to covering live events without a presenter.